Last Hurrah for Chivalry is a Chinese swordfight movie. It’s a period piece with ancient costumes and weapons. What makes this film interesting is that it’s made by director John Woo before he became synonymous with modern Hong Kong gangster movies. At first glance, Last Hurrah looks like any other Chinese period action movie. But it becomes apparent that John Woo is behind the camera when the characters turn out to be more complex and morally ambiguous than you might expect. The movie starts with an action set piece in which the man who is defeated remains shaken, but alive. The movie had set me up to think he would learn virtue by learning kung fu so that he could exact his vengeance. But didn’t turn out that way, to my pleasant surprise. Last Hurrah features two stock heroes: one is immediately recognizable as a good guy by his fitness, humble origins, and the fact that he loves his mother. He’s introduced in a scene where he for some hungry children who have stolen some food from a swaggering thug. Our other hero is darker. He’s a drinker and a drifter. He hangs around the cathouse dreaming of the day he can afford some affection. One of the prostitutes seems to like him, but he reminds her that he is a loner and no good for her. The heroes get used by the man from the first scene, who turns out not to have much potential for good after all. He manipulates our heroes into fighting for him when in fact, if they had all the facts, they’d either stay out of the fight, or fight against the man. They do the right thing but for the wrong person. It’s an interesting and unlikely turn of events for a genre that’s usually more simplistic than this. The fight scenes are uneven — there are some choppy ones at the beginning that get things off on the wrong foot — but there are some very good scenes later in the film. The fights are very sword-heavy, and for connoisseurs, you can watch the extra feature on the weapons used in the film to learn a bit more about them. Overall, Last Hurrah for Chivalry is fairly forgettable for those of us who are not die hard Hong Kong action fans. It’s better than average, especially considering the complex character motivations, but it’s still basically a formula story, made at a big studio, by a director without enough pull yet to really focus on art and personal vision. The best extra feature is the short segment on weapons used in the film. 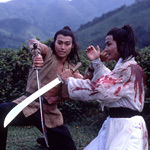 Hong Kong cinema expert Bey Logan shows and tells about the two primary types of swords used in the film, along with some of the “supporting” weapons used elsewhere. This feature is short enough and unique enough to be worth a look. The other big deal is the audio commentary by Logan. Logan clearly knows his subject well. But this was the third audio commentary I’ve heard from him, and it’s simply too much information to fit in my skull. Actor X was in Film Y and was also the Action Choreographer on Film Z. Logan would be more interesting if he provided less information, just hit the high points, and spoke with a more exaggerated inflection. After three feature-length movies, I know his voice well enough that it puts me to sleep. There are three audio options for the feature film: Chinese 5.1 Surround, English 5.1 Surround, and “Original” Chinese mono. The original mono has different music and different sound effects than the 5.1 tracks. The original sounds cruder, bolder, and simpler, which goes better with the 1980s film style. The 5.1 track is more subtle, lighter, and more nuanced, and it just doesn’t fit as well. You miss the funk guitar, electric bass, and disco background music that made the movie jump off the screen. The new music on the 5.1 track is more orchestral, and therefore more common and more innocuous; it disappears. To exaggerate the difference, think of Ennio Morricone compared to, say, a for-hire studio orchestra. The English dub is not bad. The dialogue makes more sense than the subtitles in a couple of places where there were too many pronouns — I couldn’t follow which “he” was doing something to which “him.” But eventually, I settled on the original Chinese mono as the best fit for the movie, with the subtitles turned on. The picture quality isn’t bad, but the film is almost 30 years old, and sometimes it shows. First, be aware that this is an early John Woo movie. That’ll help frame it in your mind. Then, watch the feature. Finally, watch the extra feature on the weapons used in the movie. Skip everything else unless you’re really a fan.